This entry was posted on Friday, November 13th, 2009 at 8:55 am	and is filed under Gluten-Free Recipes, Seasonal Foods. You can follow any responses to this entry through the RSS 2.0 feed. You can leave a response, or trackback from your own site. Ooh I bet this is so good with the leeks! Yum! You should link this up to this week’s Holiday Food Fest (details on my blog) – you could win an apron! Thanks so much for mentioning me…believe it or not after all the butternut squash I’ve posted lately I still have 3 more in the fridge. Yep. I actually have 2 leeks leftover from yesterday – this soup looks like it would make good use of both. I’m bookmarking this – hopefully I’ll have time to make it this weekend. This soup, or a close Italian version of it, is what I’m having tonight…. and I might add with my own homegrown diminutive butternut squash. Since I still have some pesto in the fridge I might add a spoonful before a grating of Parmesan Reggiano. My cheese mentor tells me the rind is the best part (so don’t throw it away folks, grate it along with the rest, from frozen works well and keeps for ages). Yea verily my soup bowl shall overfloweth with gratitude to you Melissa and Anne and the www boys at Cern. Thank you for setting my simple comment into such a great blog post. I like your FFF version. Your variation to the soup sounds very good and may have more body. I shall most certainly try it. Thank you :). Hope it does not mess up your new kitchen :(. Hope you are happy with it and is all you have hoped for. I, too love Parmigano but have taken of late to Pecorino Romano. Our former italian tour manager pointed it out to us and I pounced upon it as soon as it popped up in my supermarket :). Melissa, are you able to purchase these italian cheeses in your area? This one is already printed out to try. But I’m really waiting for help on our first GF Thanksgiving. When is it coming? this looks and sounds fabulous! thanks so much for the history lesson. loved it. Oh yum! The flavours in this are fantastic! I really need to make my own soup again soon =D. Bloody hell, she gets every where that Anne!!! Thanks for the head’s up about the Holiday Food Fest. The apron is darling. Yes, it’s squash soup season around here, that’s for sure. Love Anne’s addition of leeks. I never would have thought of that. What a great idea with adding the pesto. And freezing the cheese and grating it. That’s exactly what I do with my expensive, pastured butter. I buy it in a block and freeze it, then grate it for baking when I need to add butter for crusts, etc. Doing the same with certain cheeses makes perfect sense (although it never entered my mind). Great tips, Cid. We do work well together, my friend. I love the idea of having a “kitchen sink soup” on the menu at the Soup Siren’s Soup Kitchen. It goes with the general theme of the bistro. Yes, we can get good cheeses around here. In fact, a friend of mine would be a perfect supplier for our bistro — or Cid, a perfect place for you to work when you move here. Cid & Anne — check out St. Kilian’s Cheese Shop here. Lovely location, lovely owners, lovely cheeses. When either of you two girls have an unfamiliar cheese suggestion for me, I’ll remember it (well, I’ll have to write it down to remember) and I’ll check with Ionah and Hugh. Here’s the link to the cheese shop. Diane at the W.H.O.L.E. Gang has a post on how to do Thanksgiving without going crazy. And GLING (a dedicated GF site) has all kinds of information. There’s lots of information available on serving up a GF Thanksgiving. Google Gluten-Free Thanksgiving and you’ll be overwhelmed with choices. Lots of my blogging friends are focusing on that this year, but not me. Good luck and enjoy the holiday! Yes, I always seem to stray from food to random bits and pieces of information. It’s hard for me to stay on task! Soup is the perfect healing comfort food. Plus, it’s an easy thing to whip up most of the time, perfect for a young person! Check out Lauren’s “celiac teen” blog, everyone. I love it that you’re doing this at your age! Good for you. You’re the one who started all this, Miles. It’s not our fault we’ve taken it to extremes. Women have a tendency to do that, you know. Geez, sorry about that. I am one of those cooks who just makes things up or “loosely” follows recipes. Then I’m not exactly sure when I did what. I redid the recipe when I read your comment. I added the coconut milk later, but I’m sure it would be fine to add it with the other liquid. Thanks for tipping me off! Love your blog and I made this fabulous soup on the weekend. Tastes amazing. I put the milk in at the end and it worked great, used LACTAID milk as I have someone in the house that can’t have coconut milk and it was what I had on hand. Thank you so much. I always appreciate hearing how my recipes come out when others make them. Anne’s recipe didn’t call for any milk, so you could make this totally milk free if you wanted (dairy and coconut milk free). Gosh, I wouldn’t like having a coconut allergy. Ugh! My heart goes out to whoever has that in your family. Just to let you know that I cooked your version today. A different concept, both good in their own ways. Girls, between us we have enough soups to get the show on the road :). That deli looks a lot like mine, perhaps they would consider a job swap for next spring/summer?! These days I can look at a shop like theirs and know automatically how much cleaning and washing is involved etc. A full time deli owner has to face all kinds of problems, like hygiene, wastage and experimenting with different cheese selections to attract buyers. Here in the UK we can usually buy excellent dairy produce from up market supermarkets as well as specialist shops, so competition is tough. I’d love to know how our continental neighbours cope… every time I’ve shopped over there, the choice has been vast and turn-over pretty swift…. wonder if wastage is a problem for them? Cheap plastic cheese entered the food chain here years ago and the housewife is sometimes reluctant to pay more for a quality handmade farmhouse cheese, which is sad for them and sad for the producers. Right now we’re stocking lovely olive wood cheese boards etc to attract Christmas shoppers in the area and save them the bother of having to sit in traffic queues and park in the city. I hope all the excellent small businesses do well in the forthcoming weeks/months…. could be sink or swim in these dire financial times. My advice would be for consumers to buy the best they can afford, perhaps less frequently but make it go further and enjoy it all the more. The Soup Sirens Soup Kitchen Cafe (yikes the name is getting longer every time ) will be a galactic winner…. fine food, first class nutritional content and advice, international flair and uniquely stylish…. what more could they ask for? Thank you for posting this recipe! A link to your blog was posted from the CSA website we both are a part of. Since we have been getting a lot of squash, I was thinking about toasting the seeds. As I was cleaning the seeds of the various squash I have I was all the sudden concerned that they may not be edible. Do you happen to know if any seeds are not fit eat? I made another batch of soup today. My veggie box was full of spinach, potatoes, squash, carrots, beets, kale and other assorted fall-ish veggies. I tried a mix of spinach, potatoes, beans and tomatoes. Odd combination, but it tastes great. Tomorrow I think I’ll try carrot, ginger soup. Yes! Have bowl, will travel. Love it! 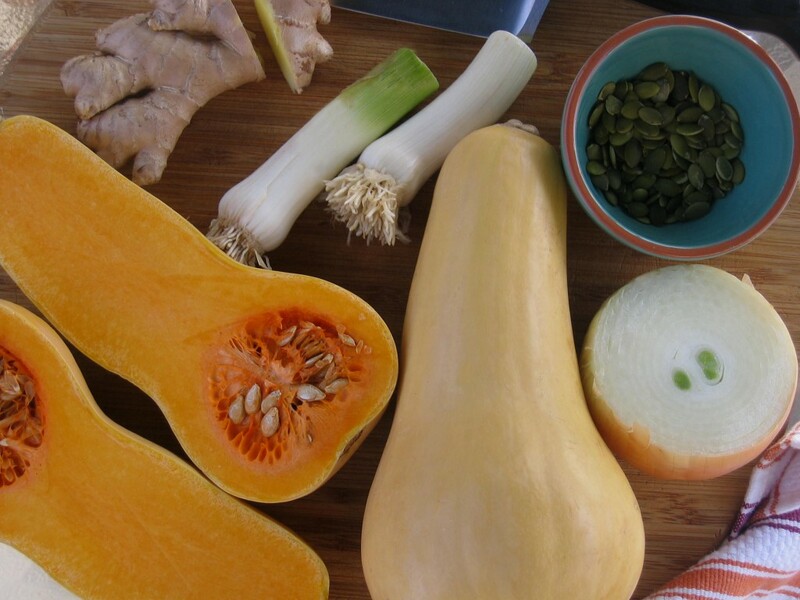 I’ve toasted pumpkin seeds with great results, but haven’t tried the squash. I would think they would work just as well though. If you don’t have a recipe, let me know and I’ll pass one along. If you’re concerned about it, email Josh at Grant Farms, but I would think there is no problem with any of the squash or pumpkin seeds. They should all work fine. Sounds great! I love roasted seeds. Thanks for the comment! Glad to hear the soup came out well. 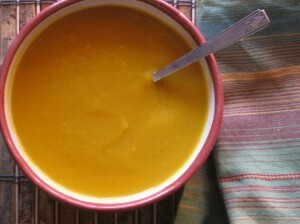 I love butternut squash soup – it’s one of my favorites. I make a curry one too but I don’t usually put ginger in it – sounds great! Beautiful color and I’m sure fantastic flavor in that soup! I always love your posts, Melissa. FFF … how true!